YOU are making this possible! to amazing nonprofits we partner with. Many world problems can be addressed through one solution: education. Why? Because knowing how to read makes people safer, healthier and more self-sufficient -- yet nearly 800 million people are illiterate and two thirds are women and girls. That's why Room to Read's innovative model focuses on deep, systematic transformation within schools in low-income countries during the two most critical time periods in a child's schooling: early primary school for literacy acquisition and secondary school for girls' education. Room to Read’s® Literacy Program transforms primary schools into child-friendly learning environments that enable children to become life-long, independent readers. 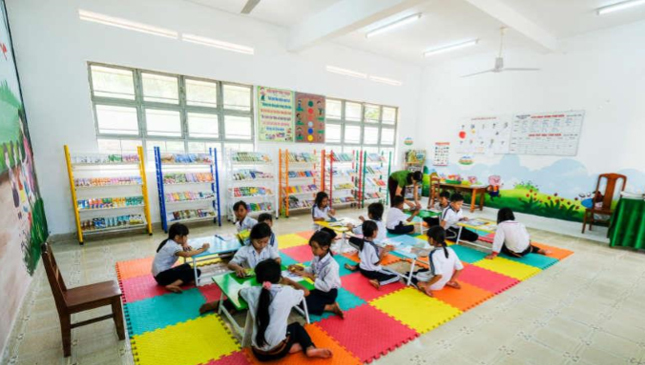 Libraries are established in a dedicated school room that is used solely as a library. This is often an unused storage space or teacher’s office. The library is stocked with books, shelving and furniture, and is designed to ensure children can easily access the library's resources. The walls are covered in maps, student work and educational posters to make the library inviting. Students may visit the library during break time, before and after school and during designated library periods. Whether or not a girl stays in school has an astounding effect on not only her quality of life, but on her future family’s as well. For a girl in one the most underserved parts of the world, staying in school longer means she is more likely to build a smaller and healthier family, lower her probability of contracting HIV, and earn a higher wage. She is also more likely to marry later and educate her own children — ending the cycle of illiteracy in one generation.